Check out these UC Davis programs that can help you prepare for a career with a science degree. If I were to offer advice to prospective college students based on my time as an undergraduate, it would be this: Find your passion and pursue opportunities that allow you to explore that passion. I grew up in Sacramento, California, the eldest child of three to immigrant parents from Ukraine. Like many of you, I was a highly motivated high school student. I took AP classes, volunteered at community service events, played soccer and ran track. I knew that I wanted to go to college, and I worked hard to achieve this goal. When I got to UC Davis, however, I was overwhelmed by all the major choices and remained undecided for two and a half quarters. I knew that I wanted to be in the medical field, but I wasn’t clear on what exactly I wanted to do. Surgery? Anesthesia? Clinical medicine? Research? All of these were new and exciting opportunities, and I would be the first in my family to explore them. 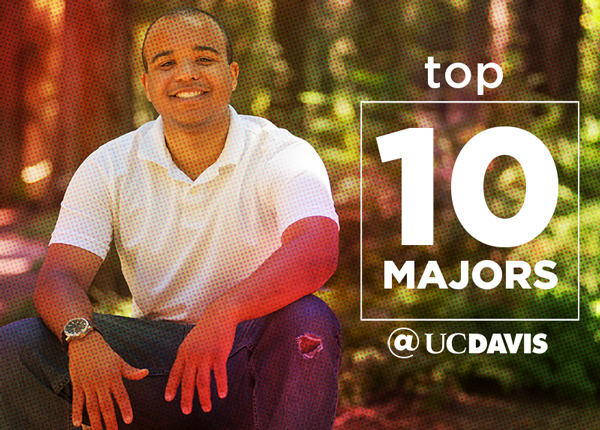 However, as a first-generation student at UC Davis, I faced challenges like navigating a complex university system, deciding my major and understanding how to choose the right courses to prepare for my future career interests. After talking to a counselor, friends, classmates and family, I decided to major in biological sciences. A year into studying cellular mechanisms, chemical reactions, fluid dynamics and evolution theory, I branched out and pursued minors in professional writing and communication. That first year in the science trenches convinced me that I needed training to be a good communicator if I wanted to share what I studied with anyone outside of my field. During that same year, an upper classmate recommended that I join the Biological Undergraduate Scholars Program. BUSP is an honors program for first-generation and disadvantaged undergraduates who want to conduct lab research. Soon after, I joined a stem-cell research lab where I looked at regenerating liver cells that could eventually be transferred to a patient suffering from liver disease. I enjoyed research. I found the concept of treating a patient with cells fascinating. I should stress here that with hands-on science like my lab participation, my biology textbook lessons came to life. The concepts I was learning in class made more sense. If you have the chance to do research, do it! I had conducted research, participated in student government and identified a good major that fit my career goals. You’d think that I did it all as an undergraduate, right? But what if I told you that in my fourth year, I led efforts to launch the Stride for Aggie Pride 5K? I decided to test myself, my skills and my abilities once again outside of my comfort zone. You see, my passion has been and continues to be health and wellness. And I wanted to organize a campus event that promoted healthy living in a fun and philanthropic manner. 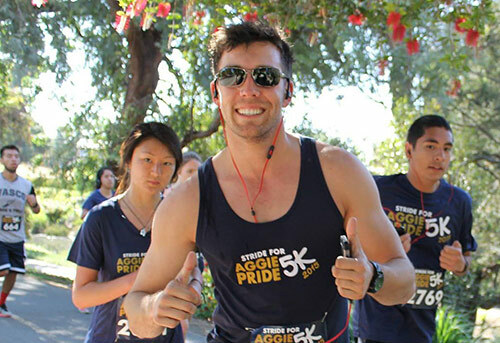 Now in its fourth year, the Stride for Aggie Pride 5K has involved nearly 10,000 participants and raised over $100,000 for student scholarships. Were sciences still my passion? After graduating, I wanted to see if the sciences were still my passion. To test this, I started a communications job in the Offices of the Chancellor and Provost at UC Davis, focused on social media. To my surprise, my biology degree came in handy in my social media work. I found that the rigorous training and analytical expertise developed studying the sciences translated into my communications work. These high-value skills learned as a STEM major will help you organize projects, analyze data, plan programs, lead marketing campaigns and much more. Clearly, a biological sciences major can take you many places. It is not a degree that restricts you to only working in a lab or pursuing medical/dental/veterinary school; it can be applied to a wide range of interests. For me, my interests allowed me to explore research, event organization, communications and clinical work. With every opportunity, I developed a new set of skills that have helped me grow professionally. I am now combining my communications skills with science as a clinical project manager and intend to pursue STEM graduate studies in the foreseeable future. I urge you to be open in exploring nontraditional career options and not be afraid to branch outside of your major as you look for your passion. Artem Trotsyuk ’13 was a biological sciences major who uses his professional skills in communications in pursuit of a biological science research career.